Join us on Thursday, December 13 from 6-10pm at the Trolley Square Oyster House! Click on the links at the top of the page to find out what to bring to drop in Santa’s sleigh! 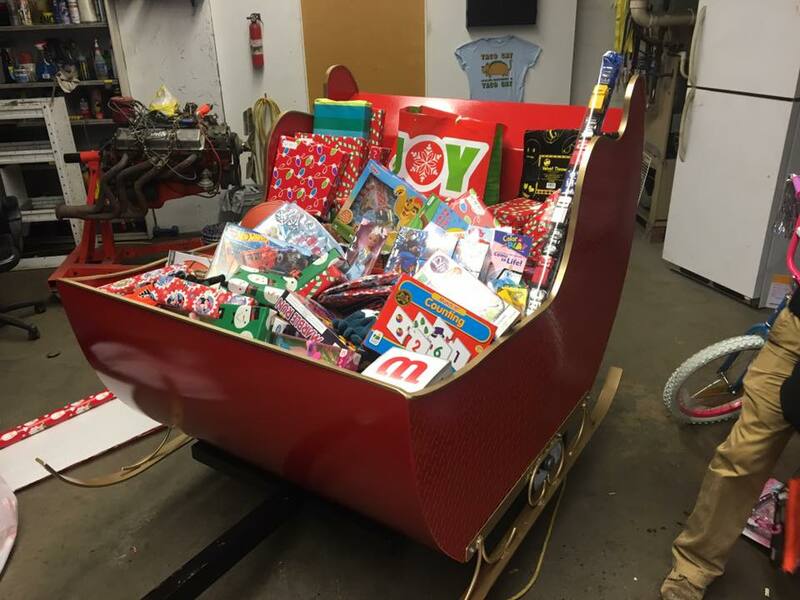 Motorcycle Santa is a non-profit based out of Delaware tasked with a mission to deliver the charitable contributions of the community to local sources that best serve those that are in need during the holiday season. Our annual campaign throughout the holiday season not only raises monetary contributions but also brings in a large assortment of donations, ranging from household toiletries to gift cards and coloring books. Where Motorcycle Santa stands apart from your typical toy drop box is how we direct and deliver these efforts. Dressed in full attire, accompanied by his head Elf in the passenger seat, Motorcycle Santa pulls a life sized red sleigh attached to the rear of his motorcycle, filled to the top with donations. Equipped with fully functional candy cane turn signals and flashing LED lighting, the sleigh helps deliver gifts in a unique fashion. Motorcycle Santa and his sleigh are not complete without being accompanied by his many helpers, which include everyone from Frosty the Snowman and Buddy the Elf, to Rudolph Red Nosed Reindeer and the Grinch himself. This crew is typically transported by a rolling “Santa’s workshop” scene attached to a trailer, pulled by one of several decorated trucks as the entire brigade comes together to form quit a spectacular view. 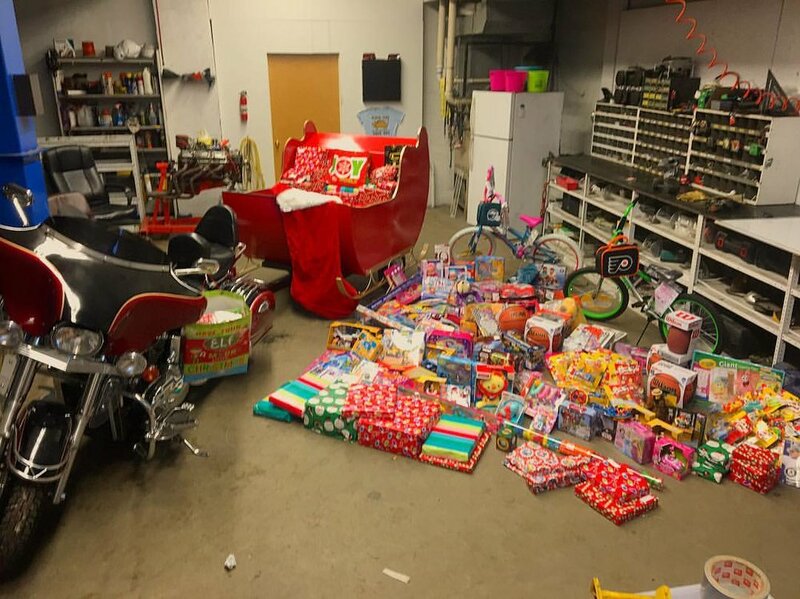 On the day of delivery, Motorcycle Santa and his parade typically make their first stop at the local children’s hospital, where a variety of donations are dropped off. These are used for families to select from to have something to give their child who may have the misfortune of being confined to the hospital during the holidays. Many families are from out of town, so this serves as a great resource for them during a tough time. The second main stop is to the Ronald McDonald House of Delaware, where in 2017 we adopted one of the 50 rooms there, thanks to our fund raising efforts. These rooms serve as a home away from home for families traveling long distances for their child’s treatment, which may last several days or weeks. During our stop, any children currently staying there are able to come out and pick through the toys in the sleigh. In addition, we donate household items such as toiletry necessities which are also available to those staying there. Motorcycle Santa is a fun way to do good, for those that could use a good smile the most. Let’s ride! This is Clarence. He is homeless. Clarence just needed a ride from the bus stop, but he got much more than what he asked for. He joined us for the entire day, helping to load and deliver donations to the hospital, as he quickly became part of the family. He tagged along for the entire ride, greeted everyone with confident spirits, and helped to hand out toys to patients at the Ronald McDonald House. We are all in this game of life together, and everyone can do something good, regardless of your walk of life.